Biological invasions provide an opportunity for ecological and evolutionary exploration of immune function in host–parasite interactions. Studying parasite-induced immune response in native and invasive species can provide novel insights into mechanisms underlying invasion success. 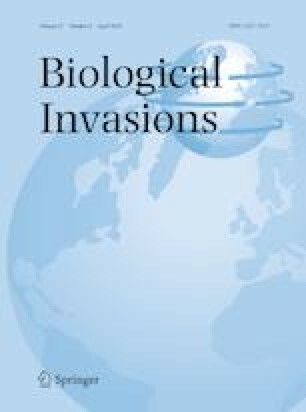 We aimed to establish the influence of mite ectoparasites on the invasion of the alien water boatman Trichocorixa verticalis (Corixidae) originating from North America. We examined the variation in a key component of insect immune function (phenoloxidase activity), and condition (fat storage) of T. verticalis and four species of native water boatmen in relation to water mites, combining field and laboratory observations in southern Spain. Mite infection was associated with a general decrease in corixid immune function (but not of fat stores), but to a varying extent in different host species. Immunosuppression was particularly high in the alien species, which also had a particularly high prevalence of mites in both field and laboratory infections. Mite infections may therefore explain the low abundance of the alien corixid in low salinity ponds, where native corixids dominated and mites were abundant. Uninfected T. verticalis had a lower immune function than three native corixid species, probably because the alien is adapted to higher salinities where ectoparasites are absent, supporting the “cost of immunity hypothesis”. This study shows that higher immunocompetence in invasive species is not the rule as previously assumed, and highlights the need to better integrate immunology into invasion biology. The online version of this article ( https://doi.org/10.1007/s10530-019-01988-w) contains supplementary material, which is available to authorized users. Miguel Lozano Terol, Raquel López Luque, Ria Van Houdt and Sara Debecker helped with laboratory and fieldwork. Doñana Natural Space provided permission for fieldwork (2014/31). The staff of the Aquatic Ecology (LEA-EBD) and GIS and Remote Sensing (LAST-EBD) laboratories of EBD-CSIC provided essential assistance. AJG, MS, RS and VC conceived the ideas and designed methodology. VC and RS collected the data. AJG, MS and VC analysed the data. AJG, MS, and VC led the writing of the manuscript. This research was funded by the Consejería de Innovación, Ciencia y Empresa, Junta de Andalucía project (P10-RNM-6262) to AJG, a Severo Ochoa predoctoral contract (SVP-2013-067595) and a mobility Grant (EEBB-I-15-10016) from the Spanish Ministry of Science and Innovation (MICINN) to VC, and a Ramón y Cajal postdoctoral contract from MICINN to MIS (RYC-2011-09382). All data used in this paper can be found at http://digital.csic.es/handle/10261/159889.